"All around me I see people laughing, joking, and walking around with these huge, goofy smiles plastered on their faces. I've begun to wonder how they do it, and more important, will I ever be able to be like that again?" Five months after his dad's unexpected death, Billy Romero is still struggling with the loss. Billy's mom spends more time talking to her Bluetooth than to him, and his best friend, Ziggy, just doesn't get it. There's no one who understands how alone Billy feels...except his new English teacher, the young and beautiful Miss Gate. I think because of the cover I assumed that Billy was a high school student of maybe 16 or 17, he was actually a 13 year old in 8th grade. I feel with student/teacher relationships it can go probably one or two ways. #1: The teacher is a predator and their student is the innocent prey or #2: The student isn't completely innocent and encourages the teacher's behavior. I would put Something Happened into the first category. To me, Billy was completely innocent. He was curious and confused but innocent. This book definitely kept my attention, I had my eyes on Miss Gate/Tess the whole time waiting to see how she was going to behave around Billy. Waiting for that moment where something happens. Billy was so lost, he lost his father, his mother isn't around much and his friends just don't understand anymore. He found a friend in Tess, someone to talk to and someone to just have fun with. Always late for the bus, Billy always ends up sitting next to Amy on the bus and they slowly begin to form a friendship which becomes as important to him as his friendship with Tess. He finds himself trapped between Tess and Amy trying to keep them both happy. Tess's reaction to Billy being unable to attend a poetry group with her one evening is one of the first concrete glimpses of her true personality. I really liked this book, I was very very very curious to see how it unfolded. I was not disappointed. The only thing that I found lacking was maybe a bit more to the ending, it was satisfying but wrapped up a bit too quick for me. Have you ever read a book that deals with a student/teacher relationship? 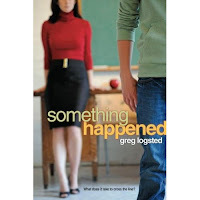 Something Happened was released November 4th. I want to read this!! It sounds so good, and no, I haven't read any student/teacher relationship type books but I do want too...I have Boy Toy and Prey at my house that I still need to read. I'm glad you thought this was good! I'm excited. Is it out yet? Lauren- I like your icon! I need to add those to my list! Yeah this came out Nov 4th, I'll add that to the bottom of the post! Boy Toy is really good, and so is Teach Me (which was edited by the same person who worked on Something Happened). Glad you liked--I'm looking forward to reading. AWESOME! I really like this one! And would love to read it! Everything Beautiful in the World which I reviewed recently has a teacher/student relationship. Secrets of My Surburban Life by Lauren Baratz-Logsted has a sub-plot with a creepy teacher who is a little too interested in his female students. That's as close as I've come to a teacher-student plot line though. I wonder if these two authors are related though. They have the same last name! OOH yay, thanks for the info. I need to get this. Amee: I think Greg and Lauren are married...I believe I read that somewhere. I want to read this one ahh. I can't say I've read one before, but this one looks great! Wow, this one looks really interesting! And your comment on my Sunday Salon was so funny because usually you are my go-to source for YA books! I highly recommend both Teach Me and Boy Toy - very different books, but both well-written and striking. micol ostow- I bought Teach Me and am really excited to read it! And I've just added Boy Toy to my wishlist, thanks! lenore- Yes, that's another one i added to my list, which is now MIA, oops! amee- Ah, i won that book from Melissa Walker's Win It Wednesday! And yeah I think Lauren is right I think they are married! shooting stars mag- It's cute! khyrinthia- I know you do! Make sure to review it once you read it!!!!! J. Kaye- It seems like a trend in young adult lit recently! S. Krishna- Hehe! Thankfully I'll be reading and reviewing more YA in the near future! You seriously have great taste in books! anne- I'm definitely going to have to get Boy Toy! I need to read Teach Me like immediately!